The range of French breads available in a good French boulangerie (bakery) is a heart-warming sight. So many to choose from, you could try a different one every day of the month. Most boulangeries also sell croissants and other viennoiseries and some sell an array of gorgeous cakes. Boulangeries are traditionally family-owned enterprises in France. Nowadays, grocery store boulangeries are also selling a lot of French breads, but I think most people would agree with me that, typically, the bread produced by these larger operations is inferior. In France, you will notice almost right away that there is one bread that every bakery sells more of than any other. This is the long, skinny baguette that makes up a fair portion of the typical French person's daily calories. Many begin their day with a tartine - a baguette spread with butter and jam, and round slices of baguette are commonly served with lunch and dinner. The crust should be golden, even and crunchy. The interior or mie as the French call it, should be airy, even holey. The mie should not stick to your fingers or to your mouth. Baguettes do not store, they are made to be bought and eaten that day. 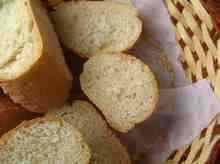 You might be surprised to find that French breads include very little sliced sandwich bread. I know you have some good ones in North America these days, but the French just don't do this. There are some sliced French breads in the grocery store here, but most are not worth bothering with. So why not try making your sandwiches like the French? Slice a baguette lengthwise, leaving a small part attached so the ingredients don't fall out. And don't forget the French are modest when it comes to stuffing their sandwich - no overflowing meat, ok? Don't just start eating the bread. It is not meant to be eaten separately and is rarely spread with butter. French breads are meant to accompany the meal, torn into bite sized pieces as you go. Don't cut the bread with a knife. A piece of bread that you are working on does not go on your plate. It goes on the table. I know, this is a hard one to get used to. You can use a bite sized piece of bread to soak up a last bit of yummy sauce on your plate. If you need to be extra polite, do this with your fork. To eat your bread with cheese, tear a bite sized piece off of what you have served yourself and eat that with a piece of the cheese. Don't spread or stack the cheese on top of a piece and take bites out of it. I remember well the day I finally understood just how important bread is to a French person. We were living down (way down) a road that dead ended in the mountains in Corsica. Torrential rains had been falling for hours on end and I was scheduled to get on an airplane with my kids the next day - my husband was away at the time (he always misses the fun parts). I had put all the kids in the car to go into town to dry out some clothes for we had no dryer in those days. As I came around a bend in the sinuous mountain road, I was astonished to find a river where I was accustomed to seeing a road. I got out of the car and as it was gradually dawning on me that I was cut off from the world and that life had just gotten very interesting, I saw in the distance a figure fording the new river. He was up to his waist in rushing water, slowly moving toward me with his arms above his head, holding something aloft. Finally, when he was across, I saw that his precious cargo was two baguettes and he generously offered me one of them. Turned out he was the forest ranger who lived at the end of the road. He had had quite a day apparently - his wife had been swept away in the flooding waters further up in the mountains and had been saved by a helicopter. None of this deterred him though from one of the most important tasks of his day - buying bread! Go from French breads to French Foods.